People have such mixed opinions regarding selfies. I personally think that if someone wants to take selfies, go for it. 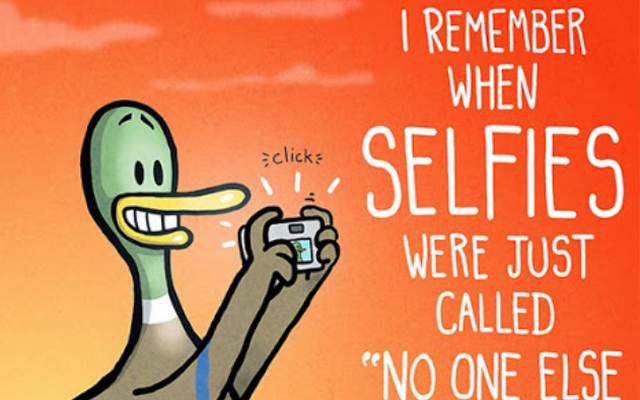 Some people, if they see someone else taking a selfie they think it's silly or that the person is egoistic. But thats not what i think... i think if someone feels awesome enough to document how they look, that is awesome. Of course, selfies can also be taken when you dont like how you look, to document so that in the future you can look back on it. But i think taking photos is awesome, even if you dont post them anywhere, they are still memories. I mean i can take a picture of my walks out in the forest or things i see or things i do and i may not post them but when i look back on the pictures i remember the day and what i did and remember why i took the photo. Either i was super happy, or i liked what i saw, or was sad etc etc And with selfies, its interesting to look back on them and see how i have changed. See how different i look in the selfies where i am happy and i just feel great, compared to the days where i have taken a selfie just because but i feel awful. Now a days i rarely take selfies, maybe the random one here and there but nothing like before. My boyfriend used to say that i took too many selfies - not in a bad way, but just that compared to him or maybe others i took alot of selfies. Now however i rarely take them at all.... and for me personally, selfies are correlated with how i feel. If i feel great and feel happy then i want to share that or document it. But recently i havent feel so great, or i mean yeah... i have felt happy and better (this is not a sad post, haha!). But i havent felt so great in my appearance. My skin looks grey and dry and their are dark circles under my eyes, because of my stomach pain and sensitivitiy it has constantly been bloated and well i have barely looked in the mirror, nonetheless taken a camera and documented how i look. Its not that i dont love myself or think i look bad, but more that i dont "feel great", and i think that can be seen on my appearance. Such as skin care hasnt been priority one and the past months of little sleep is taking its toll now on hair, skin, nails and dark circles under my eyes. And i think we can all agree on that when we look tired and worn down, we dont feel our best. But also i dont think my body has been absorping nutrients so well which also affects skin, hair and nails. But each day i try to do my best to make myself feel good and know that those things will solve themselves and a little more self care is necessary! So my opinion is that selfies can be great, i dont think you should live your life through a camera screen... sometimes you just have to live in the moment and not document everything. But i think that if someone feels awesome enough or happy enough or just wants to take photos... let them. Ohh and i guess there is a difference from taking selfies just for the memories and keeping it to yourself, to updating 3 different selfies on your IG or facebook each day, but if someone wants to do that then i guess thats great!! Naaw, i am sorry to hear that. Try to work on self love and loving yourself, many can struggle with seeing themselves in photos. Even i struggle with that at times, but know that you arent ugly!! One day you will be able to take selfies or see yourself in a picture and not mind and not critisize yourself :) You are beautiful just the way you are! !